Few sword enthusiasts today know swordplay from firsthand experience, and we can trust that movie directors exaggerate what we see on the big screen, for the sake of art and ticket sales. Little girls are not encouraged to carry or play with knives. While our brothers got Swiss Army Knives or Leathermen for their birthdays, we got Barbie Dolls. And those dolls were so encased in plastic that we had to ask our brothers to use their new blades to cut the poor things loose. Some women, however, have broken the Blade Barrier. These are women who fight with blades, entertain with them, throw, swallow and chop wood with them. These are girls who play in the boys' yard, compete with them and win. With that in mind, I present here twenty of the most spectacular Girls Who Play with Knives – in no particular order, and in all their glory. Swords and the arts of fencing and sword fighting have been in existence for thousands of years. Over the last few decades the art and style of sword play has changed a great deal. As Kung Fu movies became popular in the late 70s and on there have been some amazing sword fight scenes in movies. Here are some awesome videos that I would consider to be among the top 10 videos of epic sword fights in movies over the years. Enjoy, and don’t try this at home, or you may just lose an eye. Not long after watching the smash hit movie Kung Fu Panda, I got to thinking... Why can't I write a blockbuster like that? After all, I watched a ton of Kung Fu movies as a kid, and they all seemed pretty much the same to me. Though it's hard to believe that The Simpsons has been on the air for nearly twenty years, my devotion to the show has not waned. I've been a fan for all of those years, following the ups and downs of this simple yellow family and their community. And yet, there was one character that always seemed a bit underrated to me. One man who could change the tone of an entire episode with a wink, a nod, and a witty retort. Welcome to the world of a devoted Minimalist Urbanite Survivalist Technologist Yuppie (MUSTY). And what the heck is a MUSTY? Well, let's just say that I've spent the better part of a decade in search of the ultimate light-weight urban survival man-purse. I've spent most of that time searching for an off-the-shelf product that would hold my cards, cash, keys and set of personalized mini-tools. Finally, I decided it did not exist. Inspired by other MUSTYs — see this guy and this guy — I began to design and construct my ultimate Pocket Knife Wallet. It turned out to be quite easy, inexpensive, and the result was very satisfying. This was the part Bond enjoyed the most -- feeling the warmth of the evening's first martini (shaken, not stirred), back to the corner, turning his mind to the pursuit of more pleasurable endeavors. And yet, there were a few points of business to attend to first. Pulling out his handmade, leather slimline pocket-knife wallet, he tucked away the computer virus signature on micro-USB stick into one of the wallet's narrow, secure and snug pockets. As he opened the wallet, Bond noticed that his razor-sharp mini-knife still had a nick and a spot of blood on it. A swipe with his cocktail napkin and quick touch-up with the file he always carried did the trick and his thoughts returned to the smoky room. James leaned back, clipping the tip of a vintage cuban cigar with his slimline scissors, as the barmaid arrived at his side. She was attractive no doubt, Bond thought as he sized her up with just a glance. "A bit pedestrian, perhaps, but you never know" he figured as he accepted her offer of a refill. "Got a pen?" she intoned, her voice full of confidence laced with just a touch of anticipation. Indeed he did -- it fit neatly between the toothpick and tweezers in yet another narrow but functional wallet pocket. He slid it across the table and watched as she took her time scrawling out something on his blood-tinged napkin. Too long for just a phone number, he thought, curiosity piqued. When she finally pushed it back across the table to him, he was intrigued to see if there was more to this barkeep than just a sultry voice and an appreciation of fine Italian leather. The Maverick - a limited edition pocket knife to honor President John McCain. OnlyKnives is proud to honor President John McCain — a true American hero — by announcing a unique new multi-tool known as The Maverick. We're very proud of the Maverick and we think President McCain will be too. John McCain has taken strong stances on some of the most important issues of our time. We hope this knife can help our leader and his fellow Republican supporters as they strive to tackle these issues. Every world leader wishes he had a tool in his toolbox that could assist him in wrestling with thorny issues that come across his desk. As a proud owner of the OnlyKnives Maverick, President McCain will be lucky enough to possess just such a tool. He will need to trade in his more traditional pocket knife upon entering office, but he can pick that up on his way out in 2012. The Change - a limited edition pocket knife to honor President Barack Obama. OnlyKnives is proud to honor President Barack Obama -- an inspirational visionary -- by announcing a unique new multi-tool known as The Change. At OnlyKnives, we're very excited about The Change and we think President Obama will be thrilled to take delivery of his knife. Barack Obama has helped the American People to believe in his vision of change and hope. We can only strive to provide a fraction of that inspiration with this exceptional knife. A side dish from the Dark Side:Sculpt Jar Jar Binks out of a root vegetable. I admit it, I've got a thing for babes with blades. Something about stunning beauty coupled with impending peril really sharpens my blade. With that in mind, I've compiled the ultimate list of hot sword fighting movie actresses. Choosing knives is one of the most important decisions an avid cook can make. Knives are among the most used tools in the kitchen, but can also be some of the most mysterious for buyers. One problem is that price doesn't always correlate with quality. 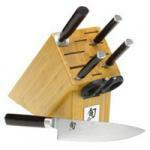 Another is that a knife's performance "out of the box" may deteriorate rapidly upon frequent use. Add in unsubstantiated marketing claims, shady salespeople peddling hard-to-recognize brand names, and buying a knife can end up resembling buying a used car. The good news is that a short list of expert tips can help you get educated in a hurry. Following those tips will ensure that you get the most appropriate knives for your budget. These tips can certainly save you a bundle of money but, more importantly, will help you walk away with great knives. If you've never wielded a light, razor-sharp Japanese Chef's knife, you're in for a real treat. After I've laid out these tips, I'll apply them to a set of price ranges and make specific knife recommendations. Of course, choosing knives is a personal decision. You'll want to consider your style of cooking, how often you cook and the tasks you frequently perform. But the recommendations should serve as a good starting point -- they're all great knives and are priced appropriately.